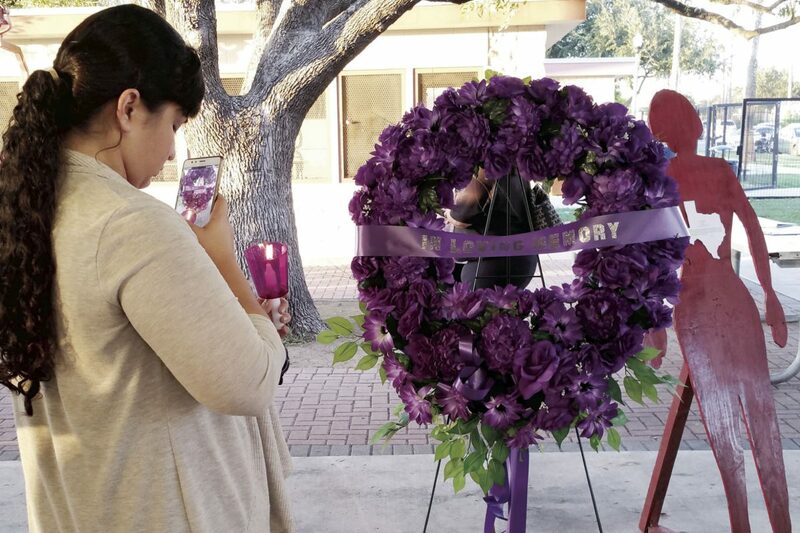 The purple wreath on display at a candlelight vigil in McAllen represents victims of domestic violence who died this year. Mujeres Unidas hosted the event at Fireman's Park Thursday. McALLEN — Mary recounted years of abuse at the hands of her guardians and two of her romantic partners at a candlelight vigil Thursday evening. Mary was one of two survivors who shared harrowing stories at this year’s Mujeres Unidas Candlelight Vigil, where more than 100 people gathered at Fireman’s Park to remember the casualties of domestic abuse. Seven females and one male have been killed in Hidalgo County this year as a result of violence in the home, Mujeres Unidas Executive Director Estella De Anda said. She listed each of the victim’s names while volunteers lit a candle in remembrance. The yearly event is one of several the local nonprofit puts together during October, which is recognized as Domestic Violence Awareness Month. It aims to raise awareness and encourages victims to seek help. Help is out there, Hidalgo County District Attorney Ricardo Rodriguez said. Now in its 38th year of existence, Mujeres Unidas continues to offer a variety of support for women, men and children in abusive situations, including a secure shelter where victims can begin to heal from their physical and mental wounds. Jenny said she first approached Mujeres Unidas to get legal advice on how to divorce her husband. Even though she suffered physical, emotional and verbal abuse at the hands of her husband, she initially told staff she wasn’t in an abusive relationship. It wasn’t because she was lying, but instead she had been programmed to believe violence in the home was commonplace. Her father was an alcoholic with a temper and her husband, whom she met at the age of 15, had been too. Jenny recalled the daily mental struggle and her desire to help her husband overcome his alcoholism despite the repeated abuse and his promise that it wouldn’t happen again. “I thought I needed to help him get out of that situation, but really it was me that needed to get out,” she said Thursday. When she finally reached out to Mujeres Unidas, staff there asked her to describe her relationship, and when she finished, Jenny was stunned by what staff told her. “ She told me ‘you are in an abusive relationship’ and when she said that, I felt like a blindfold had been taken off my eyes,” Jenny said, trying to hold back tears. It has taken time for both survivors to heal, though some scars remain. Yet, they remain optimistic about their lives and the possibilities that lie ahead. “There is help,” both women stressed. For more information about Mujeres Unidas, call 1(800) 580-4879.